Gödöllö, Hungary, 1933. The Fourth Jamboree. 25,792 Scouts in camp. Jamboree daily paper printed in Hungarian, English, French and German with contributions in other languages. Unofficial laguage: "Jamboreese", which consist mostly of signs emphasized by a happy smile. Each foreign contingent had a "Cousin", a local Scout able to speak a foreign language. First participation by Air Scouts. first issue of commemorative Scouts Stamps. 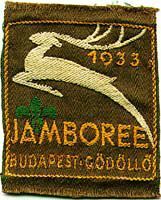 The Jamboree Badge: The White Stag of Hungary ..... " You may look on that White Stag as the pure spirit of Scouting, springing forward and upward, to leap over difficulties, to face new adventures....."